Clyde enjoying a ride in his new Trac Fab chair! 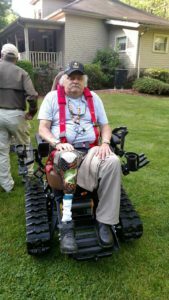 Clyde Compton, a Vietnam War veteran who has been blind for 20 years and given both legs for our country, just received a brand new Trac Fab chair this morning. 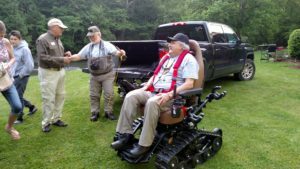 Project Healing Waters purchased the chair through Defender Mobility with donations collected completely from individuals in Virginia. We are so excited to see our movement grow from Michigan to other states across the nation. Seeing deserving veterans get their own freedom back is the reason we do what we do here at Defender Mobility. Effected by Agent Orange, Clyde is a man that has stayed positive through it all. He didn’t have a bad word to say regarding any misfortune that’s come in his life. Agent Orange is a defoliant chemical and herbicide, known for its use in Operation Ranch Hand during the Vietnam War. It has caused devastating and extensive health problems for our veterans. Upwards of 4 million individuals were exposed to it in Vietnam. Today, over 1 million are now suffering serious health issues, including Clyde. Two years ago, Clyde lost his second leg to Agent Orange complications. While he was in the hospital, he also lost his wife. For the past 20 years, Clyde’s wife willingly dedicated her time and love, caring for Clyde due to his disabilities. With his caretaker gone, Clyde’s close friend James Christian stepped up to care for him. James drove Clyde to our meeting spot today at Sycamore Run. Located in the Blue Ridge Mountains outside of Lebanon, Virginia, we met on a 400 acre piece of land with 10 miles of streams. An absolutely gorgeous backdrop, it was the perfect place to surprise Clyde. 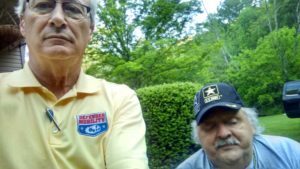 We were also met by 20 veterans and a few Healing Waters organizers. Even at 7:30am everyone was excited! As soon as the chair was gifted to Clyde, the fun really started. “When we left Clyde had already caught two trout! His grandson was there and everyone just had a lot of fun. You should have seen Clyde getting around on that chair, it was amazing. Better than a lot of guys that can see!” said Jim. 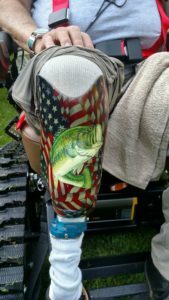 Clyde proudly showing off his prosthetic leg, complete with an American flag and trout jumping out of the water! 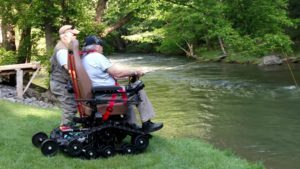 Healing Waters was started in 2005 to help wounded military service members at Walter Reed Army Medical Center. Today, they’ve expanded across the nation and established their program in Department of Defense hospitals, VA Medical Centers and clinics, and Warrior Transition Units. All of their resources serve those in greatest need. It’s a philosophy that has led them to become a leader in the field of therapeutic outdoor recreation. 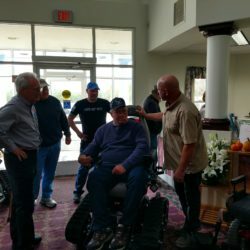 While Defender Mobility was in Virginia this morning, we really got a chance to speak with some of the people involved in Healing Waters, including Jim O’Brian. You can truly tell that they’re all the kindest bunch of volunteers, caring for each other. They are selfless people who will do anything to help out our veterans. It was such a wonderful morning and we are glad that Clyde is so happy. 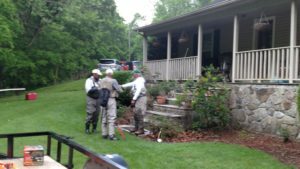 There are many more opportunities for him to continue fly fishing in the future now! POAM President, Jim Tignanelli, with Clyde. A few of the guys getting ready for the surprise. The new Trac Fab chair. 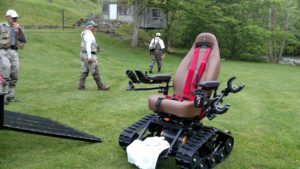 Michigan Vet receives Trac Fab ChairA Virginian Veteran is Next!